During the 2016 election debates, candidate Trump proposed a solid wall as a solution for limiting illegal immigration from Mexico. The wall would stretch between the United States and Mexico while supporting dispersed checkpoints along the boundary. Mae Ngai, professor of Asian American Studies at Columbia University traced the intricate history of immigration legislation and construction of identities through immigration during the 20th century in her book, Impossible Subjects: Illegal Aliens and the Making of Modern America. Ngai focuses on the years 1924 to 1965, which was marked by the passage of the Johnson-Reed Immigration Act of 1924 that implemented a national origins quota system. This act signaled the beginning of politicizing immigrants into categories of undesirables such as criminals and anarchist. In near granular detail, the book divided into four parts that primarily examines the beginning of immigration legislation from the 19th through 20h centuries. Specific case studies of Chinese, Filipinos, Mexicans, Japanese Americans present different cultural layers of American pluralism and demonstrate the complexity that Congressional legislation experienced. Ngai is specifically interested in quota legislation, boundaries of class through immigration, alien citizenship during World War II, and immigration reform during the Post-World War II. Throughout the book, Ngai demonstrates the contradiction with the term “illegal alien” which she argues was the product of immigration restrictions. The illegal alien became an impossible subject “whose inclusion within the nation was simultaneously a social reality and a legal impossibility.” (4) Another major theme of the book focuses on the path to citizenship which was opened to legal immigrants, but the illegal aliens that remapped territorial boundaries through travel were barred from national membership. Ngai skillfully and continuously focuses on pivotal points in American legislation and its enforcement such as the enforcement of Canadian and Mexican boundaries in the late 19th century which has become a popular debate in recent politics. While her book focuses mostly on the 20th century, it was necessary for Ngai to point out that the northern and southern boundaries of the United States were enforced to “deter Chinese and Europeans” and undesirable classes. (64) Weaving class conflict and creation, Ngai concludes that enforcement was the consolidation of American sovereignty over a physical territory. It was a process that led to the creation of the first land Border Control legislation in 1929. It became a misdemeanor “punishable by one-year imprisonment or $1,000 fine, or both” if an illegal alien was found and caught. (60) Subsequent punishment increased the penalty toward deportation. Untrained officers in Border Control often overextended their physical areas of arrests and apprehension by hundreds of miles which led to a review and reform of Border Patrol legislation. Over time categories of immigrants have shifted from the periphery of American citizenship to the forefront of legislative debate. Ngai describes new classes of laborers and colonial subjects. Chinese exclusion from the 19th century persevered well into the twentieth century. Marginalization of the Chinese restricted them to the Chinatown ghettos, limiting their participation in society despite the Supreme Court ruling of 1898 that American born Chinese were citizens. Ngai clarifies historical immigration intertwined with social citizenship. Chinese exclusion was elevated beyond legislation as Americans were convinced of Chinese racial un-assimilability which ultimately concluded that American born Chinese were permanent foreigners. Masterfully put together, Ngai immediately follows the Chinese assimilation theme with a study of Japanese American experience during and after World War II. In a similar situation, Japanese Americans were believed to be easily assimilated into American life. Japanese Americans bought land to farm, opened shops, and learned western traditions whereas Chinese Americans were observed to hold onto traditions. While American citizens consumed Chinese food, culture, and products, their membership into society was restricted. However, as the bombing of Pearl Harbor led to the internment of Japanese Americans, many Japanese either joined the war or could participate in legal battles for freedom. Ngai points out the distinctions that were observed between groups of immigrants, highlighting the way culture defined new perceptions of American identity and territorial sovereignty. 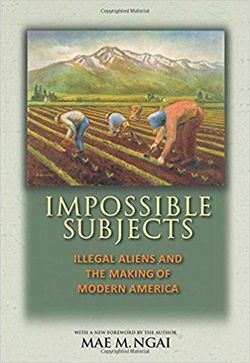 Readers reminded throughout Ngai’s book that contemporary terms such as “alien” immediately equated to illegal Mexicans rather than a complex history of immigration restrictions of Europeans and Chinese. Thus, the book is refreshing explaining the cultural quota of American populations experienced a series of policies coinciding with combinations of economic cycles of a post-industrial period and rhetoric of maintaining an American identity. Thus, immigration reform became analogous with discussions of civil rights through a struggle for membership and recognition as a citizen. Immigration reform was particularly evident in the book’s conclusion in discussing a post-World War II America in which an influx of American Jews, Italian Americans, and Greek Americans, and others struggled for equality during the post-New Deal. While lengthy and greatly detailed, Ngai compacted many of her major points into the conclusion that American cultural pluralism was becoming more prevalent which criticizes ideas of American nativism and cultural homogenizing assimilation in the United States.